One of my favorite reviews for Blood Related. 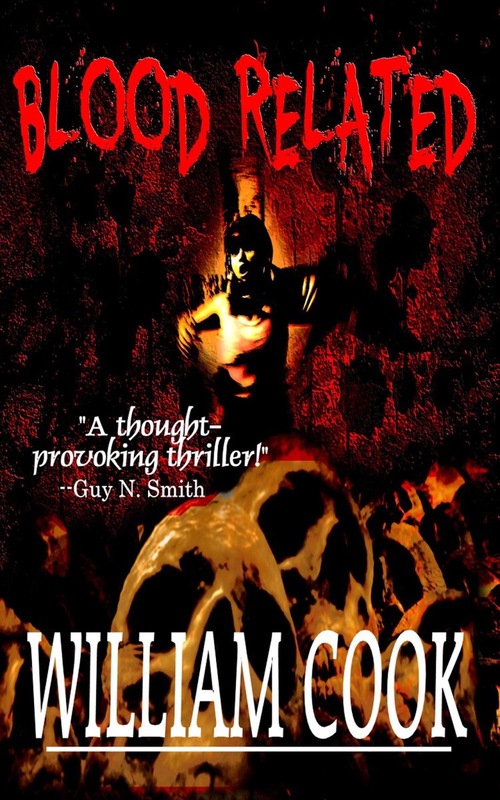 William Cook’s Blood Related delves into the mind and dark psychology of a serial killer named Caleb Cunningham. The story centers around Cunningham and his family who have all been connected to a series of brutal murders over a number of years. The story begins with a psychiatric overview and then progresses to Caleb’s version of events. The format of the narrative is interesting in that it makes not two shifts, but several. The first chapter is a first-person perspective from a court appointed psychiatrist. Through her, we get a very rough overview of the Cunninghams. We learn that there are twin brothers, both deeply psychotic and sinister. The psychiatrist examines Charlie during the course of a trial, but then becomes heavily involved with Caleb. We learn that Caleb is the true monster and the bulk of the narrative then becomes Caleb’s diaries, journals, and psychiatric sessions. Later chapters shift again to a series of newspaper articles giving the reader a final summary of the events that Caleb’s first-person account misses. The novel closes with a series of letters from Caleb explaining his motives and leaving the reader and his doctor with a cryptic goodbye. Caleb’s story is fairly straightforward. Abused as a child, he’s described as “evil,” “one of the most dangerous men alive,” and the like. Cook’s writing is fluid and descriptive, but Caleb’s exploits take on mythological proportions as the story progresses. Cook goes to great length in his research of abnormal psychology. He skillfully uses the terminology and psychiatric evaluations to create an authentic element to the narrative. Caleb’s excesses are in stark contrast to the realism in other areas and it’s a jarring juxtaposition at times. As a study in dark psychology, Blood Related is an interesting tale. Cook does an excellent job grappling with the disturbed mind. Psychiatry struggles with the abnormal that goes beyond the human comprehension of evil. Cook takes on the challenge of this struggle and handles it well. A more subtle handling of Caleb’s story would have added a great deal to the psychological framework. Definitely worth a read for the insight into a twisted mind. During the course of research for my first novel, ‘Blood Related,’ I read many books about Serial Homicide, both fiction and non-fiction. In order to understand what makes a serial-killer murder others this research was heavy reading. I found myself becoming desensitized to the violence after the first ten books or so, every now and then something would turn my gut and stand out as unique behavior that differed from the other cases. The central character of Caleb Cunningham is an amalgamation of these behaviors and personality types as I read them. Once ‘Blood related’ is published, I will post a personality profile that outlines CC’s psychological status. As promised, here is the Non-fiction Bibliographical source list.